I got a tad excited when I read about the 100% cashmere shawls from Everlane. Actually, I got even more so when I saw the price tag and the factory they were made in. Most of the luxury brands outsource the production of their cashmere clothes and accessories to factories in Scotland. Chanel swooped in to save Barrie Knitwear which is based in Hawick, Scotland when it went under. Well, they have a perfectly good reason to because the mill has been producing knitwear for Chanel for the last 25 years along with a few other luxury brands. All the 100% cashmere knitwear from Hermes are manufactured in Scotland as well. Now we all know that the fibers aren't homegrown in Scotland as those goats aren't native to the country. I'm not saying all the mills in Scotland produce high quality knits either. It very much depends on the type of yarn they use. The longer the fibers, the better and less likely the garment will pill. The diameter is just as important as fine fibers will produce soft knits. I'm no expert in all things cashmere but what I do know is the Scottish mills produce some of the best quality knitwear in the world. You can read more about cashmere here if you're interested. I've paid full retail price for Hermes cashmere/silk (65% cashmere 35% silk) shawls and I've also been that idiot who queued up for hours outside Palais des Congre for the privilege of buying them at 40% off. I have a mild addiction to cashmere shawls BUT common sense must prevail as the cost of these lovely Hermes shawls have risen quicker than inflation. I thought £670 was enough to induce a cardiac arrest and these days, they're £100 more. 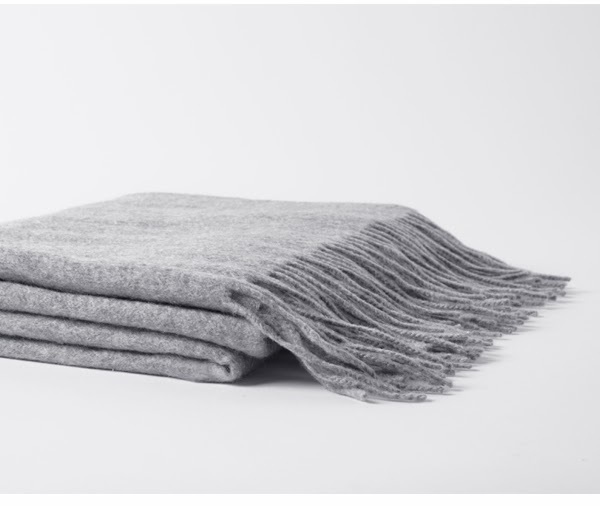 For those of you who look for quality above all things, you'll be pleased to know that the Everlane's 100% cashmere shawls are produced in Hawick and cost a mere USD 250. Check out their Scottish factory here. **Thanks, Sue for the tip. It's expensive for those of us in the E.U to purchase from Everlane as the duty tax is exorbitant. Besides, the shawls are made in Scotland and easier to source from the home country. The alternative is Johnstons of Elgin or Brora who are fairly well regarded but still affordable. Any else has any recommendations? I noticed that the cashmere on Everlane was done by Hawick and Hawick have a shop in Harrogate which is on my hit list to investigate when I get a chance. Yup - I quickly did my homework too. The name immediately rang a bell and saved me the trouble of looking in to how to get it shipped to the UK (because Everlane haven't got us on their map yet). Hawick is a town in Scotland but there's also a Hawick cashmere company too, named after the town. Let me know what the quality's like. Did you look on the Johnston's website? £299! There are a few that I've linked to that cost £149. I'm no expert but I've seen ones that are loosely woven, almost gauzy in appearance to others that are 3 ply and heavy. So, I didn't realise that I wanted a cashmere shawl until I read your post. I'm not sure why because I'm all about the cashmere and all about the shawls/scarves. I guess at 37 I finally feel grown up enough to have one! Thanks for the tip. That cashmere shawl looks so cozy! I'm a sucker for anything cashmere. There are some decent looking cashmere stoles on the Pure site, and on the MyPashmina site as well. Johnstons makes knit for Brora and Pringle so they're both pretty much the same quality even though the prices can differ dramatically between brands. I actually think my favorite cashmere makers are Italian though - Brunello Cucinelli and Loro Piana makes some of the best cashmere I've seen for prices that seem fair. Johnstons Cashmere can sometimes be extremely thin, particularly their 2 ply sweaters. That being said, I'm trying to avoid cashmere unless I can find something that's 4 ply and that I know comes from a sustainable Mongolian farm. I *think* The Elder Statesman sources yarn like that, but his prices are so far out of my range, I think I'll just settle for some eco-friendly merino for now. I'm in love with Loro Piana cashmere but the prices do reflect the quality. I had no idea that Johnstons supplies Brora and Pringle. 4 ply cashmere will be divine but I think the price tag will be pretty hefty too.